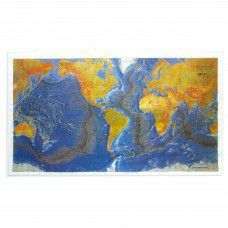 This World Ocean Floor Raised Relief Map uses Marie Tharp cartography to focus attention on the subsurface ocean floor features. Fracture zones, mid ocean ridges, and the continental shelves feature prominently on this map. Land relief is also shown with the continent names and limited cities. Otherwise, no political information is indicated such as country borders or names. This World Ocean Floor Raised Relief Map is centered on the Americas so as to keep the large ocean areas of the Atlantic, Pacific and Indian Oceans from being split by the edge of the map. Item Number Size / Framing Options Price Qty.